I always love having a momento for special occasions like wedding showers and birthdays. 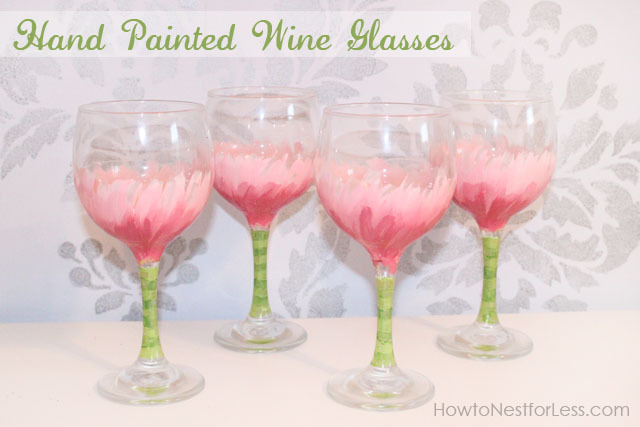 One of my favorite things to make is painted wine glasses for each of my guests. I have an upcoming Summer Girls Retreat with some of my best friends and Plaid was nice enough to send me a bunch of great supplies to complete my project! To get the rest of my supplies I headed to Walmart. 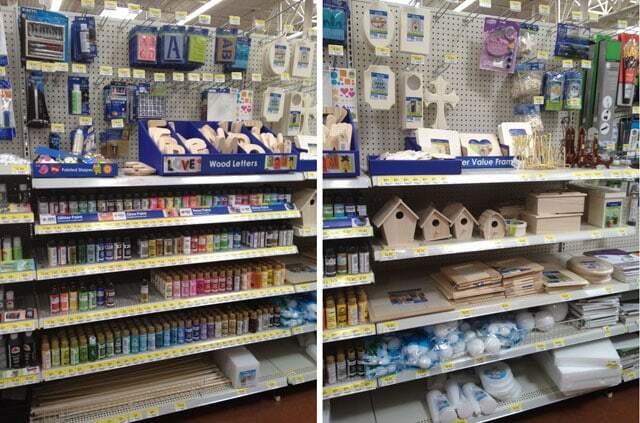 I was shocked at how many Plaid Crafts products were available in their aisles! 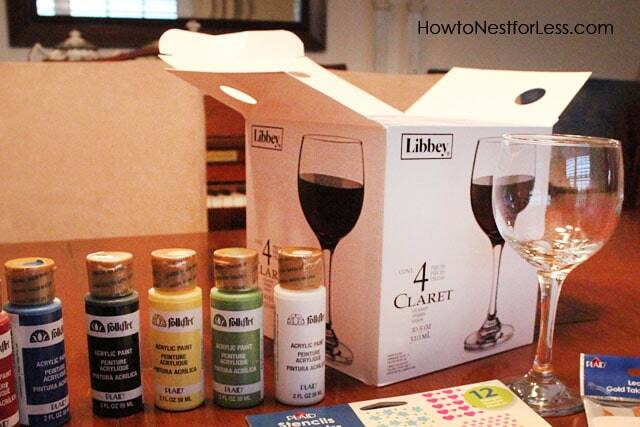 To begin, choose your paint colors for the wine glass and put a little dollop of each color on a palette or paper plate. 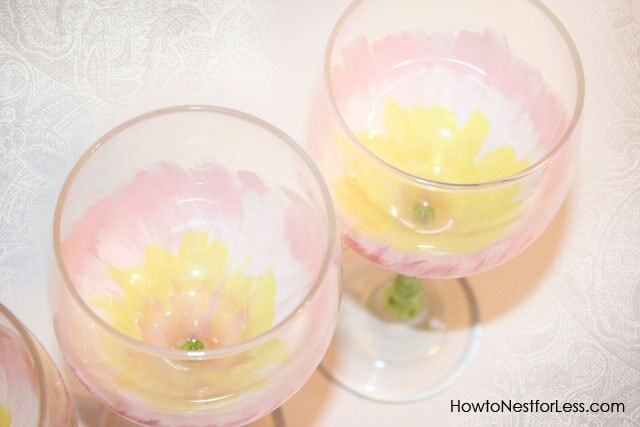 Turn your wine glass upside down to it is easier to handle. 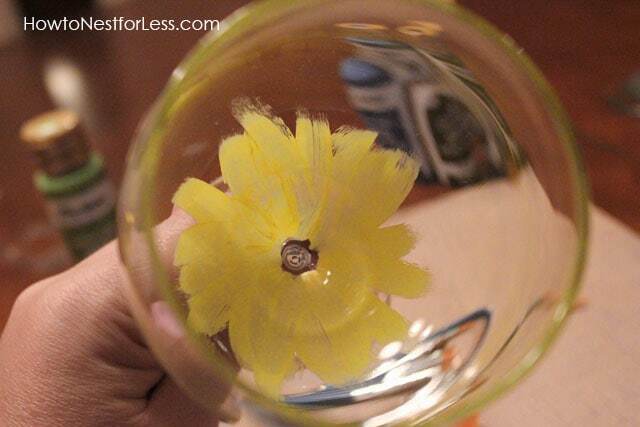 Using a smaller Plaid paintbrush, paint the small center of the flower with short strokes on the outside of the wine glass. Now you’re ready to start layering colors. Starting about halfway up the yellow center, start painting small strokes with your second light based color (I chose light pink). 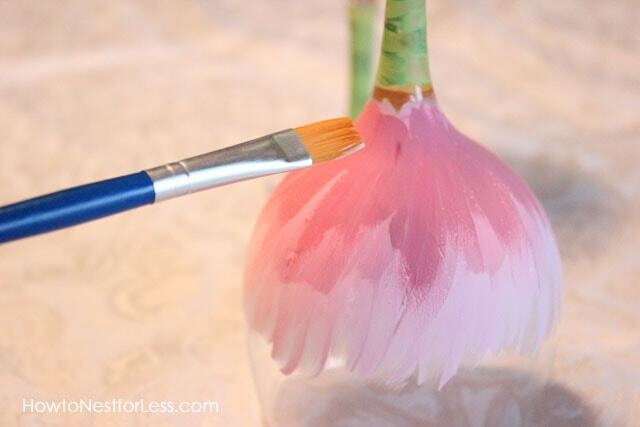 It’s ok if your paint strokes are uneven; it will help your flowers look whimsical! Now start adding the darker tones to the base of the flower to give it some depth. I also added green and yellow tones to the stem of the wine glass in horizontal stripes for fun! Since Plaid Folk Art paints are acrylic, you’ll need to seal the paint to the glass so it doesn’t chip or flake off. 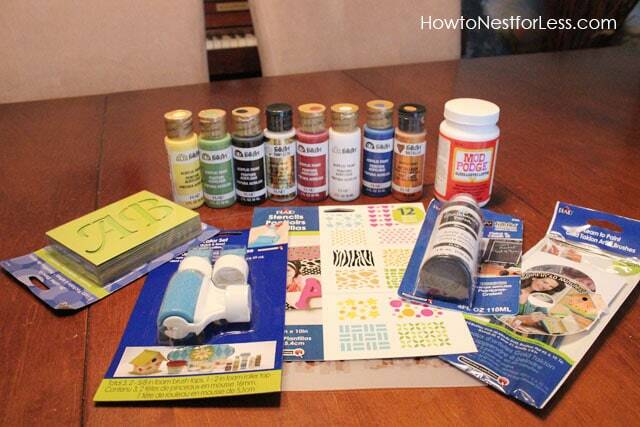 I used Mod Podge acrylic sealer spray. 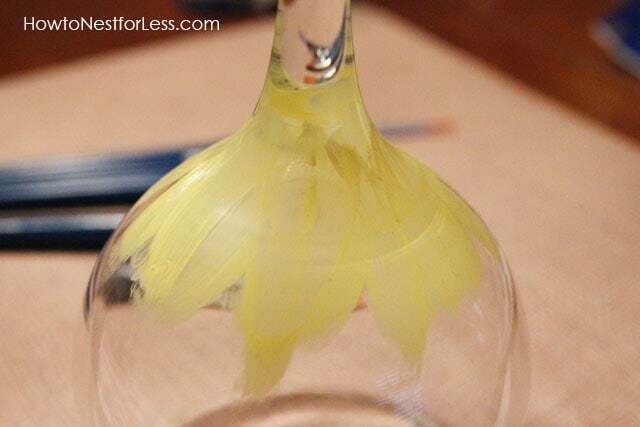 To easily apply this to the wine glasses, I sprayed some of it into a small cup and applied to the glass with a paintbrush just over the painted areas. Let dry for 24-48 hours before use. And that’s it! Beautiful hand painted wine glasses for just a couple of bucks! Please remember that these wine glasses are not dishwasher safe. Hand wash only. All of the Plaid supplies I used can be found at Walmart, including the wine glasses. LOVE getting all of my shopping done in one place! That’s really beautifully done, I’ll follow the idea. Thanks for sharing. These are just delightful – so bright and cheery – perfect for setting a summer time table or having the girls over for a wine and cheese party. They look like something you could buy at Bloomingdales or Neimans. Aww, thanks so much Diane! You’re too sweet! Those came out beautiful! They would make a great gift. Great job! They turned out so pretty! These are SOOO pretty! I feel like I could do them! they are so pretty ! swoon…. Cute! 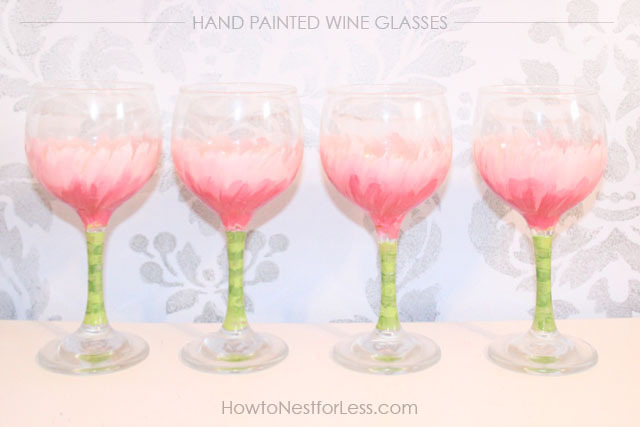 I love this to save a couple of dollars, dollar tree sells different sized and styles of wine glasses and other glasses as well! Good idea about the Dollar Tree!! I’ll check them out, too! I love this idea! 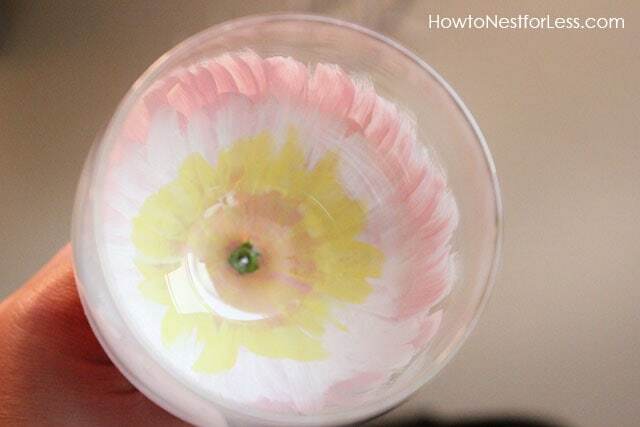 The stems of the wine glasses remind me of Truffala trees. These are so pretty, looks better then the ones you buy at the store. I tried making these last year for my girlfriends birthday and they were a total bust, Now I know who to go to 🙂 Thanks for linking up. I just featured them on my fb. Thanks Annie! Yep, the sealer is great 🙂 They have a bunch of new products out now (I think available at Michael’s). 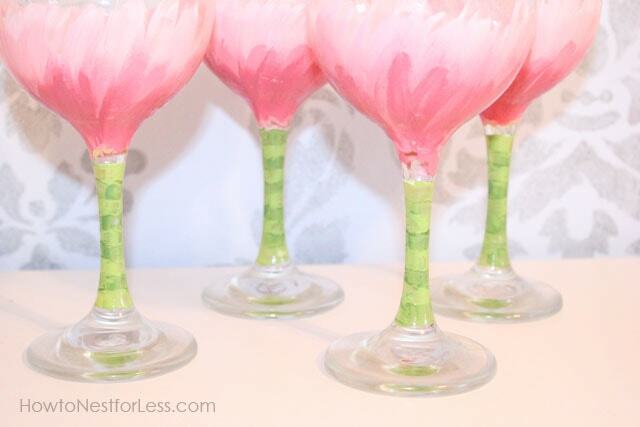 luv these glasses, have to make some for myself …do you have any ideas what i might paint for favors for a “tiffany themed bridal shower” i am doing for my daughter…you are a very talented young lady! These are absolutely beautiful! Amazing job! These are lovely and would make great gifts! I will be trying this as soon as I can get to Walmart for supplies! Thanks for the very clear tutorial and the good pictures, makes it so much easier to follow! Erin, thank you so much for sharing this! totally beautiful, very clever, I wish we had a Walmart. Are you blending colors at all? Mine look solid at the bottom and it seems like yours have some shading. I’m not sure how to do that. Yes, I blended the colors. Let the first coat dry, and then slightly overlap the second coat so it almost creates a gradient. Hope that helps! Hi! I hope the blog is still going for my question! Did you seal entire glass? And is it safe to drink from being sealed all the way? Or did you tape off top and seal below that line for food use? Thanks so much! These are beautiful! They’re painting on the outside of the glass so it’s perfectly safe to drink from!